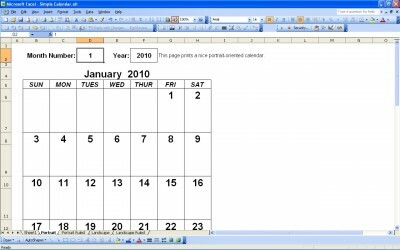 A perpetual calendar is defined as a calendar that is suitable for reuse year after year. The day, month and year in a perpetual calendar can be adjusted to reflect the any year. This is a monthly calendar template with a simple design that is easy to read. There is a formula already built into this monthly calendar template that will change the calendar date based on the month and year that you input. You can use this perpetual monthly calendar for as long as needed. This is a simple number-in-a-square letter-sized monthly calendar template. Use the link below to download this perpetual calendar monthly calendar template for free. Instructions on how to use the Excel monthly calendar are listed in the first worksheet. A nice feature to this monthly calendar template is the ability to print the perpetual calendar in landscape or portrait forms. Use print preview to see what the perpetual calendar will look like before you print. You can print out as many consecutive months as needed. Download our perpetual calendar free monthly calendar template from the link below. If you are looking for other monthly calendar templates in Excel, see the related templates links or browse our library for more Excel monthly calendar templates.